It was in 1983 when an American entrepreneur and Buddhist practitioner by the name of Adam Engle first learned that His Holiness the 14th Dalai Lama was interested in collaboratively working with scientific researchers from the west to objectively study the affects introspective practices have on practitioners well-being and health. Subsequently, it was during the following year when the great spiritual leader eagerly accepted Engle’s offer to arrange a summit where the two sides would formally come together, and also when the late great Chilean neuroscientist Francisco Varela, who was deeply interested in scientifically studying Buddhism, offered his expertise and influence to the project. While it would be easy to assume that the three men hailing from Tibet, Chile and the United States shared little in common, they’d all come to passionately believe that while Buddhism and science were methodologically different, both applications aimed to investigate the true nature of reality with hopes of improving the quality of life for humanity and the planet. Moreover, all three men desired to bridge the gap between the great eastern spiritual tradition and the empirical study of the west, and it was due to this shared aspiration that Engle, Varela and the Dalai Lama would work to facilitate a conversation between the two sides by organizing regular gatherings for discussion. Although the trio wouldn’t formally establish the now distinguished Mind & Life Institute until 1991, the first official Mind & Life Dialogue took place in 1987. Since then, the organization has held 33 Mind & Life Dialogue summits, which individually focus on a theme related to the betterment of mankind, that’ve brought together some of the world’s greatest scientific and spiritual thinkers. 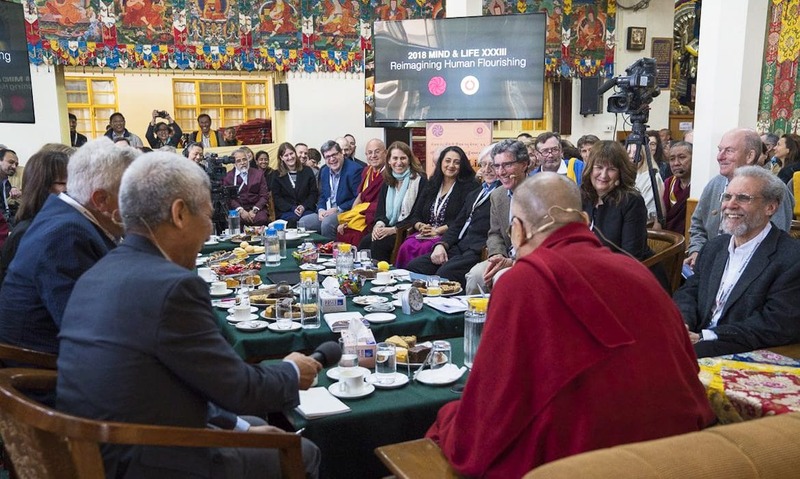 Most recently, from March 12th-16th, the 2018 Mind and Life Dialogue, Mind & Life XXXIII, took place in the Dalai Lama’s home city of Dharamsala, India, and we’ve aimed to recap the event’s happenings and highlights here. On the first day of Mind & Life XXXIII, three prominent psychological figures gave presentations on topics related to early childhood development and social and emotional learning (SEL) with the first speaker being none other than the eminent psychologist Richard Davidson. During his talk, Davidson, who is the Director of the Center for Healthy Minds at the University of Wisconsin-Madison and the Chief Scientific Advisor of the Mind & Life Institute, previewed the week ahead by offering introductory insights on human development, discussing the importance of children’s socio-emotional health and raising a number of fundamental questions needing to be addressed. After Davidson’s presentation, and a short break for tea, the renowned developmental psychologist Michel Boivin took center stage to discuss the various factors that play a role in framing early childhood development. Citing the work he’s conducted and oversaw as the Director of the Research Unit on Children’s Psychosocial Maladjustment at Université Laval’s School of Psychology, Boivin told the audience how developmental trajectories are governed by a complex interplay of genes and environment. The second day of Mind & Life XXXIII picked up where the first one left off and featured three presentations aimed at bringing the application of social and emotional learning (SEL) in the classroom to life. With hopes of showing how the Dalai Lama’s vision for the future is already being manifested, renowned University of British Columbia (UBC) psychologist Kimberly Schonert-Reichl presented first and offered a broader overview of SEL in modern education today by sharing a variety of relevant statistics related to the topic. For the second presentation of the day, Sophie Langri and Tara Wilkie, co-founders of the Montreal based Institute of Social Emotional Education, discussed the work they’ve done teaching SEL through a practical framework called CS3: Core Skills in Three Domains. Based upon their experience implementing and researching the affects of the program, which aims to improve children’s emotional literacy in regard to themselves, others and their communities, the duo has found that when students are taught about their feelings and needs, they’re much better able to manage and regulate emotional disturbances. The conversation on day three of the 2018 Mind and Life Dialogue narrowed from the broader application of Social and Emotional Learning (SEL) to the important socio-emotional capacities of attention, the ability to focus the mind on a particular sensory object or task, and meta-awareness, one’s ability to be aware of their own thoughts, feelings and internal states. In similar fashion to the first two days of the summit, there were three presentations on the third day, the first of which was given by University of Miami neuroscientist Amishi Jha. During her talk, Jha, who’s also the Director of Contemplative Neuroscience for the UMindfulness Initiative, shed light on her research examining the relationship between attention, mind-wandering and meta-awareness, and told the audience how Mindfulness Meditation can improve one’s metacognition.